And who doesn’t love Harry Potter Day? I love sleeping a bit too much to get out to a midnight showing of anything, but Rexroth and I are taking a long lunch together on Friday to see it — by which point I expect just about everyone in the WORLD will have already seen it, but I bet we’ll get awesome seats! Anyway, the Harry Potter movies are fantastic examples of books turned into movies. Some may gripe that the early movies weren’t the best adaptations, but the last few have been brilliant (and I expect the same from Half Blood Prince). But there’s been books turned into movies for decades, both good and bad, and I’m curious to know some of your favorites — and which ones you think are particularly bad, too! At the top of my list: The Princess Bride. Superb book, wonderful movie. Rexroth and I caught a screening of it last month at the Red Rock Amphitheater, and the 9,450 seat house SOLD OUT for a twenty-two-year old movie. That’s film that stands the test of time. Way down near the bottom? How about The Cat In The Hat? Kt literary client Daniel J. Blau makes a strong case for its suckiness. What’s on your list, good and bad? And which books do you LOVE that have never seen celluloid, that deserve viewing? ← Ask Daphne! What about MY book? I love Harry Potter's book-to-movie adaptations. They're very enjoyable and well done. The worst? "Confessions of a Shopaholic". Nothing to do with the original and the result was a completely mediocre storyline. Same goes with "The Nanny Diaries". One that should be made into a movie already is Janet Evanovich's "Stephanie Plum" series. It's fantastic! I agree, PRINCESS BRIDE-the movie– was much better than the book. NORTH AND SOUTH–the BBC version of Elizabeth Gaskell's book. I thought the animated version of CAT IN THE HAT was wonderful, I didn't bother with the other. TWILIGHT was hard to watch, though I did enjoy the first book. As a writer, the "big time" means a movie, but it's kind of a scary thing to think of someone else adapting your words into their own creation. However, if Joss Whedon wants to take a crack at one of mine, I'm all for it. I know this is heresy, but I love any Jane Austen movie better than the book. But that's just because something about Miss Austen's writing style just bothers me. On books I love that I love the movies equally I have to say The Little Princess. I adore the book, and the movie makes me cry every time. On the dark side, I detest the newer version of the Planet of the Apes. The Planet of the Apes is a fantastic read and the original movie was classic. The remake? Horrible. The humans can talk and there is no Cornelius. Pierre Boulle is rolling in his grave somewhere. I also think the movie I, Robot movie was equally horrible. At first I thought it was supposed to be a rendition of Caves of Steel since it centered around a detective. Instead it was something that talked about the three laws, involved a woman named Susan Calvin, and had robots in it. The rest was nothing like I, Robot or Caves of Steel. Dating myself here: The movie Shining Through was so bad I bought the book just to see how, if it was as bad as that, it could possibly have been made into a movie. It's now one of my favourite books ever. I can't STAND the Keira Knightley Pride & Prejudice, although I realize I'm in a minority here. OTOH, the version of Persuasion with Amanda Root and Ciaran Hinds was wonderful. It's also possible to make mediocre books into terrific movies… although I admit my mind is a blank at the moment! Wow! I’m nearly giddy to answer this, and that’s probably because I’m giddy to see Half-Blood Prince. My sister turned me on to the HP books, but because we live on different coasts we have only been able to see the first movie together…nine years ago! Friday I’m flying out to Reno for a visit with my sister and we’ll get to see it together. Yay!! As for some of my favorite books turned to movies…well, you said it with The Princess Bride, but I also loved Lord of the Rings. I don’t think I was the only one worried when they announced Peter Jackson would be making a movie of LotR. If you’ve seen Meet the Feebles then you know why I was worried. Personally, I was blown away by Jurassic Park, although I think the movies got worse with each one. After the first one, they lost some of the scariness that the books had. Others that I’ve loved are, The Shinning, Children of the Corn, Christine, Cujo, The Green Mile…they’ve done some good work with Steven King’s books…well, some of them. And good lord, I can’t begin to list all the books that have been ruined by coming to film. One that kinda sticks in my head with all time suckiness is Congo. The freakin talking gorilla—erm, excuse me, the MAN in a gorilla suit, took a book that was gripping and scary and made it into something that made me laugh. For the first Harry Potter movie, I went with a friend to the midnight showing- got on the news screaming and getting a whole theater to do a HP cheer- now I have to get a sitter before I can see this one! It's crazy to think about the difference between then and now! My fave all time book to movie adaptation was Gone With The Wind- that one was fabulously done. So well, in fact that when I think back to the book, the movie images are the ones that pop in my mind instead of the original ones in my imagination. Another I LOVED was Sisterhood of the Traveling pants! I think they changed things up a bit, but I still totally loved the movie. The worst adaptation EVER for me was Great Expectations with Ethan Hawke and Gwyneth Paltrow… Why even use the title of the book if you are going to differ THAT much from the original story??? Oh, I forgot to mention that I'd like to see the Eve Dallas series by J. D. Robb turned into a tv series. But in order for it to be as real and gritty as the books, it would have to be on HBO or something. Which reminds me…I'm loving True Blood based on the Southern Vampire series. Great topic! A couple books I enjoyed that just didn't work onscreen for me–The DaVinci Code (moved too slowly for me and the suspense/action just wasn't there) and The Notebook (loved the book, but onscreen it just seemed a bit too melodramatic and staged). I actually really enjoyed the Shopaholic movie (Isla Fischer was a crack-up! ), although I haven't read the book yet so I can't really give a fair comparison. One movie I enjoyed more than the book was Devil Wears Prada. I found the main character in the movie to be a bit more sympathetic (in the book, her negative attitude made me less smypathetic to her plight at times). Plus, Meryl Streep was just awesome as Miranda Priestly–great casting! I always thought that Jurassic Park (the book) was pretty meh, but the movie was excellent. Miyazaki's version of Diana Wynne Jones' Howl's Moving Castle was gorgeous even when it diverted from her plot in some large ways. On the other end of things, The Seeker was a hands-down shameful attempt at adapting Dark Is Rising to the screen. It was painful just watching the trailers and seeing how badly they had lost the entire point of the story. My favorites (that I can think of right now): To Kill a Mockingbird, followed closely by The Princess Bride and Charlotte's Web. I just watched the Princess Bride on abc Family last night. I saw the movie, like, five times but I love it so much. I have not read the book though. I, too, can hardly wait to see Harry Potter. I already bought tickets for a Thursday night show! I liked the film adaptations of TO KILL A MOCKINGBIRD and DAVID COPPERFIELD (the BBC version with Daniel Radcliffe). I'm just going to hop on the band wagon and say how much I love Princess Bride. But I haven't read the book. Guess I'll have to! Of the HP movies, I prefer Chamber of Secrets and the last two. Everyone raved about the Azkaban movie but I didn't think it matched the book. Electric Landlady, you're definitely not in a minority. I detested the Keira Knightley version, even though I'm a fan of hers! Does anyone know why the Artemis Fowl series hasn't been converted to celluloid? I think they're just crying out to be made into a movie. While I'm not a fan of the books, either, I didn't think Eragon made a good transition to the big screen. As for books I'd like to see as films, I'd LOVE LOVE LOVE to see a feature length film (as opposed to the BBC miniseries) of Neil Gaiman's NEVERWHERE. The Princess Bride is one of my all-time favorite movies! I didn't care for the Keira Knightley version of P&P either – absolutely LOVE Colin Firth & Jennifer Ehle! My major problem with several Austen movies is that I have read & reread her books so many times that it pains me to see things left out or changed! I would love to see Sarah Prineas' The Magic Thief turned into a movie – and Cindy Pon's Silver Phoenix. Also think Suite Scarlett would be a great movie! I agree that THE PRINCESS BRIDE is a truly excellent movie. And as for GONE WITH THE WIND: Yes! Sooo good! Also agree about most SK movies not being too great, excepting THE GREEN MILE, DOLORES CLAIBORNE and STAND BY ME. (I think THE SHINING misses the point of the book.) Although … MAXIMUM OVERDRIVE is so freaking awful it's kind of awesome. (Love that soda machine!) The TV version of A WRINKLE IN TIME is deeply sucky. What I'd really like to see is one of John Connolly's Charlie Parker mysteries made into a good film. Saw the latest HP last night. I was worried because a lot of the user reviews were really torn because they left out a few fairly huge parts of the book. I’m a huge HP fan, so it seemed like I wouldn’t like a movie that left out giant chunks of important plotline. But…they did a great job. 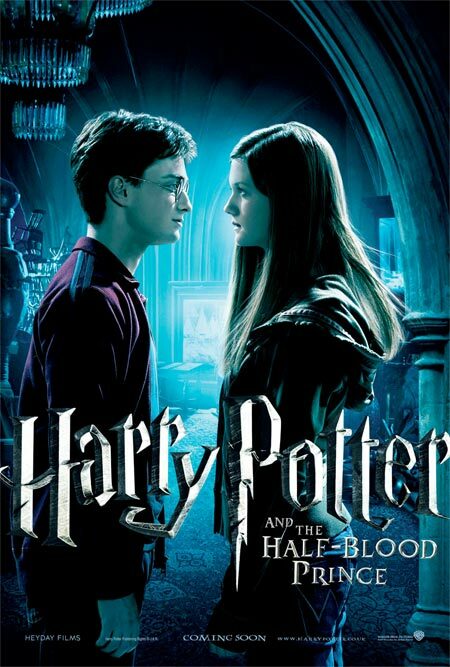 I loved the movie, I thought it was one of the best adaptations of the HP series to date. I did here that one of the scenes that they left out will be used to start the next movie, so that made me feel better. They did screw up a scene or two and I winced, but you always know that the movie is never going to be as good as the book, so you have to make allowances for that. As far as other movie adaptations…I loved The Little Princess,one of my all time favorite movies. I actually liked the movie version of The Notebook better than the book….and, I’m cheating here, because I haven’t read the book yet, but I loved the movie Stardust (Neil Gaiman). I have to agree with Jamie on Gone With The Wind as being my favorite movie from a book. I actually prefer the movie over the book. I think some of the movies from Stephen King’s books were good, but they didn’t scare me the way the book did. That could be also because if you have read the book you pretty much know what is coming. I also liked the movie for Nicholas Spark’s A Walk to Remember. A bit off topic but one book that was adapted horribly into film was Eragon. They did such a poor job that I'm pretty sure they won't be doing any sequels. Oh well at least the rest of the books in the series have been incredibly entertaining and very well written, at least so far. I'm ambivalent about seeing the latest Harry Potter. For me, the leads' acting is pretty pathetic, especially as I love the books and can hear/see them in my mind. Not at all who has been cast. I agree with the comments about the Jane Austen movies being better than the books. I struggled finishing the one I've read. But the stories are great. I enjoyed Jurassic Park so much, I read the book. What a disappointment! For me, the book captured the essence of the plot. Another movie I really like, although most critics panned it, is The Postman. I found the story believable and liked how the hero's earlier connection with the military group led to his victory over the group's leader. The book was so much worse. It ended with two super-humans fighting instead of the Postman battling the military leader.